The Dray Dry Herb Vaporizer from Mig Vapor sets a standard in this vape category. With a stylish, easy-to-read OLED screen you can perfectly customize your temperature down to one-degree Fahrenheit for the ultimate efficiency and flavor! 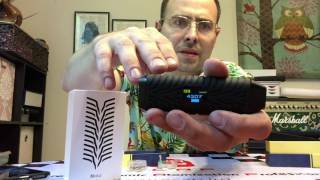 This vaporizer offers smooth pull and sleek, unique design features, making it a favorite portable vaporizer for the full control and easy enjoyment of your favorite dry herb products. Great for a quick vape or extended enjoyment, this device is durable and easy to use. Instead of rapidly clicking to power on and off, this vaporizer requires you to hold the power button for three seconds and that’s it! Easily power on, load the chamber, and select your temperature down to the degree! The Dray Dry Herb Vaporizer’s ability to heat up quickly and precisely is the key to the complete and flavorful enjoyment of your herb. While other handheld vaporizers may overheat quickly, Dray has remedied this worry with a stylish, comfortable rubber casing and a vibrating feature that ensures you always know when your device is ready! The vaporizer vibrates when powered on and when it has reached your selected temperature. This feature also prevents the device turning on unnoticed in a pocket or purse. With a convenient magnetic mouthpiece and removable mesh screen, this intense herb vaporizer is easily a favorite for quick application and cleaning. The vaporizer arrives with a kit that includes necessary tools like tweezers, a dab tool, cleaning swabs and a small brush. It’s great to have a product arrive already including everything needed to keep it looking and feeling new! The kit also includes a USB adapter with a cord to keep your high-performing 1800 mAh Super Cell battery powered. Another clean feature of this handheld device is the wedge lipped quartz chamber that makes it even easier to fill with your favorite herb. The chamber evenly heats up the product to your specified temperature and allows complete control over the size and density of your clouds. With customizable temperatures ranging from 385 to 430 degrees Fahrenheit, there’s no worry of a burnt taste. In fact, the flavor produced from this incredible vaporizer is impressive! The herb is heated evenly and perfectly to pull a smooth, full flavor. The Dray Dry Herb Vaporizer offers effortless customization and quality dry herb vaporization at an affordable price. The DRAY is one of the latest from Mig Vapor that hits all the marks for a great herb vape. This kit comes all the essentials AND a 90-day warranty just in case. The DRAY by Mig Vapor is one of our favorite herbal vaporizers thanks to its quick heat-up ability and extremely sturdy design. This herbal vape is great for first-timers due its very easy-to-use - right out of the box - setup. The Dray takes all the headache out of using an herbal with friends ( or by yourself ).